Fountain Square, Downtown Evanston. The Fountain Square project is scheduled to be completed in spring 2018 after a winter hiatus. The Fountain Square project –– scheduled to be completed in May 2018 after delays due to weather and coordination issues –– will focus on pedestrian access and safety in anticipation of winter. Lara Biggs, chief of the city’s Engineering and Capital Planning bureau, said the goal is to finish paving, clear the sidewalks and contain construction to the north plaza before winter arrives. The recent rain caused delays in renovations of the south plaza, Biggs said. She said work on the south plaza, as well as paving, is expected to finish in mid-November. More significant delays in the north plaza have stemmed from coordination issues related to the contracting process, Biggs said. The construction team has poured the base of the memorial wall on the north side of the plaza, but more work remains to be done when construction resumes in the spring, she said. Ald. Donald Wilson (4th) said he is disappointed with the contractor’s pace. Wilson said he expected the project to be finished in time for the winter holidays, and he has received feedback that reflects “varying degrees of frustration and aggravation” from business owners and Evanston residents. 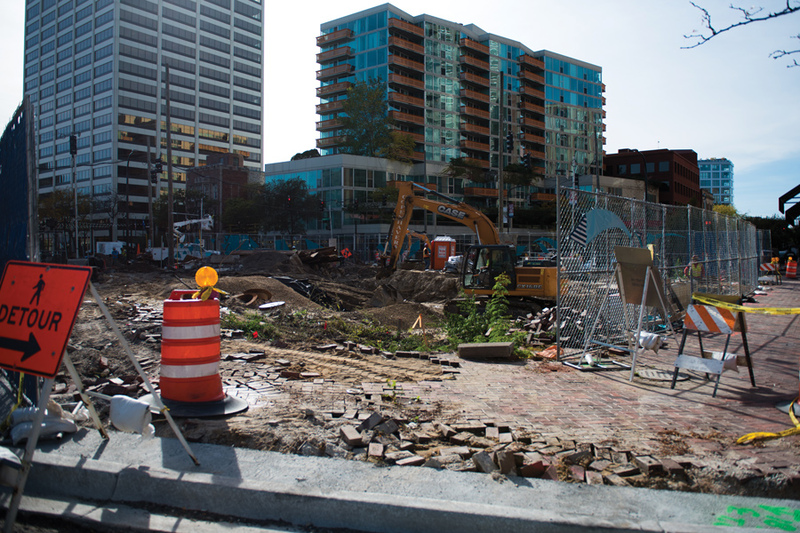 For businesses close to Fountain Square, slow construction means slow business, Wilson said. Jose Hernandez, assistant manager of Freshii’s Evanston location, 1596 Sherman Ave., said he noticed a negative impact on the restaurant a couple months ago. Hernandez said customers have trouble finding a place to park amid the construction. Parking has also been an issue for drivers picking up delivery orders, he said. Despite having received some complaints, Biggs said the Evanston community has been mostly supportive of the project.